Honolulu, Hawaii — Maluhia has been recognized by the Medicare Quality Improvement Organization for Hawaii, Mountain-Pacific Quality Health Hawaii, as a winner of the 2008 Striving for Excellence Award â€“ for significantly lowering its pressure ulcer rates over the last three years. 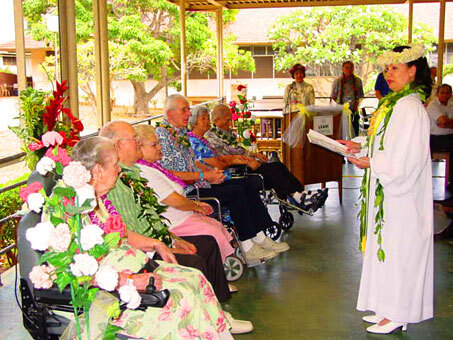 Honolulu, Hawaii — Leahi Hospital, as part of its National Nursing Home Week activities, May 12-16, hosted a renewal of wedding vows event for three couples. The nursing home staff honored Mr. and Mrs. Howard Dornan, Mr. and Mrs. Vincent Clark, and, Mr. and Mrs. George Tamura who celebrated their 68th, 47th, and 50th anniversaries, respectively.